Watching an old woman's Petpets while she's away isn't the most glamorous of jobs, but the pay is decent, and it's an easy way to earn a little extra pocket money, right? They're just Petpets, how bad could it be? Petpetsitter is played entirely with your mouse, which is used to drag Petpets from room to room and to drag a mop onto areas that need cleaning. Best described as a stress management game, your goal is to tend to the needs of an increasing number of Petpets by placing them in the proper rooms. If you take too long to address a Petpet's needs (as indicated by a timer directly under them), you'll lose a life, and in some cases may have a mess that needs to be cleaned up. You can gain one extra life by typing the code oscillabot at any point during gameplay. If you lose all of your lives, it will be game over. 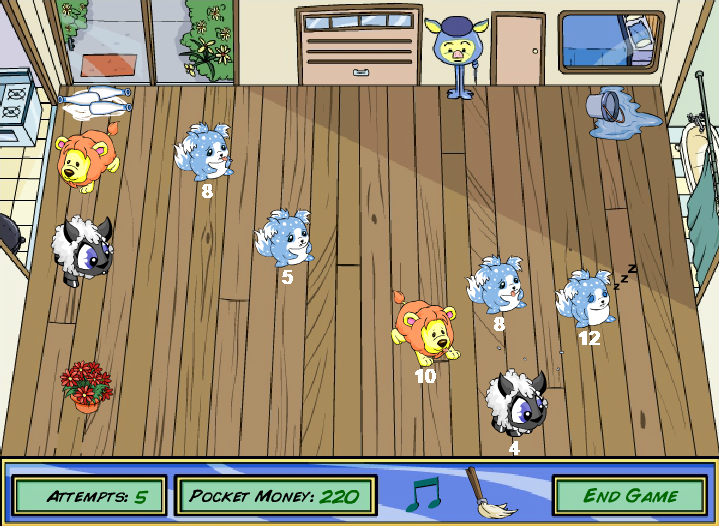 Over the course of the game, Petpets will wander around the house, occasionally knocking over items and causing a mess. There's no way to prevent this, and you'll lose points (referred to in-game as pocket money) every time it happens, but you can earn twice as many points as you lost for cleaning up the mess by dragging the mop found at the bottom of the screen onto it. When a Petpet stops moving, its needs must be addressed, as detailed in the table below. The main means of scoring points in Petpetsitter is by addressing the needs of the Petpets, but be aware that if you're not paying attention and place one in the wrong room, you'll lose points instead. You can also earn points by cleaning up the messes they make. As the game progresses and you have your hands full just taking care of the Petpets, however, you'll likely find that you no longer have time to clean up. As each of the objects in the room must be cleaned before it can be messed up again, you'll lose no further points if you leave the messes as they are.